David C. Updyke was born in the vicinity of Cayuga Lake, New York, about 1830. Said to have been raised in an upstanding family that boasted some of the leading citizens of New York, Updyke was a black sheep. In 1855, he went to California where he was employed for two years by the California Stage Company as a stage driver. Three years later, he sailed to British Columbia to look for another kind of work, but finding nothing there that suited him, he soon returned to California spending two years in Yuba County, then two years in Virginia City, Nevada. By 1862, word was spreading of the rich gold finds in Idaho and Updyke went first to Florence, then Warren, and by the fall he was in Boise County where he worked a valuable claim on Ophir Mountain. 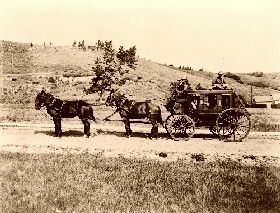 By 1864, he had saved more than $1,500 dollars and went to Boise City where he bought a livery stable in the center of town. Though Updyke had committed no known crimes up until this point, he had begun to consort with a number of criminals. Before long, the livery stable became the rendezvous site for some of the Old West’s most reckless bands of robbers and road agents. However, this did not stop David Updyke from being elected Sheriff of Ada County in March, 1864. Though many of his cohorts were ruffians, they were a strong power in the Democratic party and Updyke won the election by a small margin. Before long, Updyke was suspected of aiding in the circulation of stolen gold dust, as well as participating in a stage robbery near Boise City in 1864. So many rough characters began to hang about Updyke’s stable that many of the citizens began to refer to them as “Updyke’s Gang.” However, he and/or his outlaw friends covered their tracks so well, nothing could be proven. Soon after his election, he avowed to break up a vigilante organization of about thirty men, which had been formed in the Payette River settlement, some thirty miles from Boise City. This enraged many of the law-abiding citizens who felt the vigilante committees were their only protection from thieving and murdering road agents in the area. But Updyke cared little about what those law-abiding citizens thought and somehow obtained all the names of the men in the vigilante group, procuring warrants for their arrests. While the proceedings and warrants were all perfectly within the law, Updyke and his “posse” secretly planned to shoot the vigilante leaders and maintain that they had resisted arrest. The plan was that 15 to 20 armed men would leave Boise City, meet up with more road agents at Horse Shoe Bend, and then proceed with their warrants to the Payette River settlement. However, word leaked to the citizens of Boise City of the plan and they secretly dispatched a messenger to the Payette Vigilantes. As Updyke’s “posse” left Boise City about 4:00 o’clock in the afternoon to carry out the arrests, the thirty members of the vigilante group were assembling in self-protection. When Updyke and his men reached Horse Shoe Bend, they failed to connect with the country road agents and went on without them. When the “posse” arrived at Payette River, they were surprised to find themselves outnumbered two to one. Forced to negotiate with the vigilantes, Updyke complied with their demands. The vigilantes agreed to go to Boise City to answer the warrants but they would not allow Updyke or his men to disarm them. After arriving in Boise City and obtaining an attorney, the complaints against the vigilantes were dismissed and they were discharged. Afterwards, the humiliated vigilantes were obviously very bitter towards Updyke and began to closely watch his every move. The public soon began to believe the “Updyke Gang” was behind nearly every theft, murder and robbery that occurred anywhere in the area. 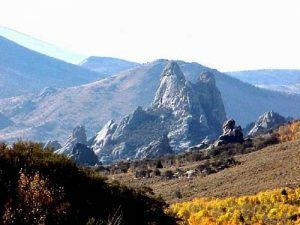 The next murderous outrage, in which the “Updyke Gang” was concerned, was the stage robbery in Portneuf Canyon, where four of its passengers were killed. On July 26, 1865, Updyke, along with three other outlaws robbed a gold laden stagecoach of some $86,000 in gold. In the melee, four of the stage passengers were killed, and the stage driver and another passenger were wounded. The vigilante committee immediately went after the three other outlaws but David Updyke was a different story. Having been duly elected as Ada County Sheriff, the vigilantes were more cautious and waited until the opportune time to punish him for his suspected wrongdoings. On September 28, 1865, the Payette River Vigilance Committee arrested him on a charge of defrauding the revenue and failing to arrest a hard case outlaw named West Jenkins. However, Updyke made bail and knowing the reputation of the Vigilance Committee, he immediately left town, fleeing to Boise City where he had more influence. However, the citizens there too, were fed up with the criminal elements and began to form groups for the purpose cleaning up the county. By the next spring, Updyke feared for his own safety and accompanied by another outlaw by the name of John Dixon, the two departed Boise on the Rocky Bar Road on April 12, 1866. Unaware that a vigilante party was following them, the two overnighted at an abandoned cabin some thirty miles out of town. During the night, the vigilantes captured the unsuspecting pair and lead them some ten miles farther down the road to Sirup Creek. The next morning as the vigilantes prepared to hang the men, they questioned Updyke about the whereabouts of the stolen cache. The crooked sheriff only glared at them in contempt, refusing to respond. The vigilantes then hanged both men under a shed between two vacant cabins. Updyke had only $50.00 on his person at the time of his death. The gold taken in the July, 1865 has never been found and many think it is buried somewhere in the City of Rocks.